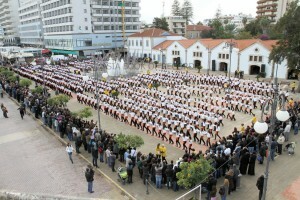 The largest Hasapiko dance was achieved by Larnaca Municipality (Cyprus) at Europe Square, Larnaca, Cyprus, on December 12, 2010, where 749 dancers participated. All the participants were dressed in white shirt and black trousers and danced to the popular Greek song ‘Frankosyriani’ for five minutes. Comments for LARGEST HASAPIKO DANCE are now closed.